Before we even started trying for a baby, I knew I wanted to try cloth diapering and Jon was on board with it. It's not as important of a decision as core parenting values and types of discipline but I wasn't about to move forward on my research without the full support of my husband, who will definitely be involved in diaper duty. He is just as psyched as I am. Now before I get more in depth, I fully respect each person's choice on how to diaper their kiddos. Honestly I couldn't care less what other people do but some people are so opinionated so if you think it's nasty and want to leave a comment about how gross we are, just skip this post :-). I can honestly say that John and Sherry over at YoungHouseLove got me really excited to cloth diaper with these two posts (1 and 2). My husband and I can afford disposable diapers (and we still plan on using them from time to time) but the cost savings is nuts with CDs! I feel like what is drawing me to it the most is the challenge. And really, it doesn't seem like a challenge to me. I have changed tons of diapers in my lifetime as a nanny, babysitter, big sister, and aunt but I have never had a baby of my own that requires multiple changes a day. It is our first baby and we won't know any different. What We Bought After lots of research (and basically just doing what YHL did), we bought 24 BumGenius 4.0 One Size Snap Pocket diapers from Diapers.com. Yes the initial investment may be frightening but we plan on using them for our flock of children to come. We chose all gender neutral colors too. These diapers are adjustable to fit babies weighing 7lb-35+lbs so you can use them up through potty training. Each diaper comes with 2 inserts, a smaller newborn one and a larger, thicker one for when baby starts eating more. The nice thing is babies tend to leak/blowout WAY less in cloth diapers because you can add more liners. The liners are similar to burp cloths. 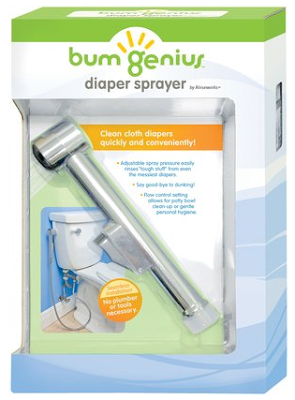 Though you can manage without one, we also bought a BumGenius diaper sprayer for when baby starts solid foods and #2 gets messier. 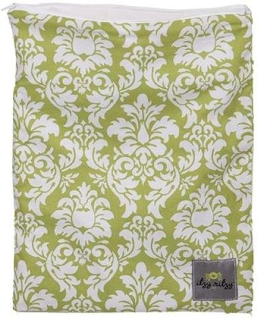 For when we are out and about, we bought this Itzy Ritzy wet bag. It is cute, really big, and well insulated so nothing will stink. 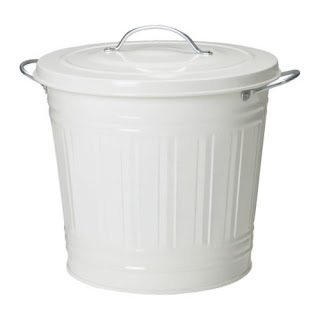 In lieu of a diaper genie, I bought this 4 gallon tin trashcan from Ikea (ours is yellow) and 2 Kissaluvs antibacterial pail liners so we can throw diapers in there when we are upstairs. It is basically the same thing you'd do with disposable diapers and the smell is locked in the pail. I will probably bring dirties down every other day or when I wash the diapers. Jon and I are new to diapering all together so we will be learning as we go. We plan on using disposable diapers for the first few weeks of baby's life just to make it easier when he pees through 4 diapers in one changing haha. We also won't be asking anyone else to cloth diaper our baby meaning that when we have baby sitters, drop him with family, or even on vacation, we will use disposable. Sometimes it's just easier to throw them away. The process doesn't seem hard at all. God willing, we plan on exclusively breast feeding which will be good for cloth diapering because we won't have to dump out the contents of soiled diapers. Breast fed babies stools are liquid enough that they don't need to be sprayed either. This will change when we introduce solids though. So wet or dirty diaper, we simply take it off his booty, crumple it up like you'd do a disposable and toss it into the diaper pail. I've heard of people getting away with owning 12 cloth diapers and washing more often but we decided to buy 24 so we didn't have to wash every day. We should be able to get away with washing every 3 days when baby is on a good eating/sleeping/bathroom schedule. When the pail is full (or I feel like washing), I will wash with natural detergent (which we already use) on cold, using an extra rinse cycle at the beginning. We have a high efficiency washer and dryer that can sense the size of the load and control how much water is used based on size. We have a drying rack and I hear it is best to dry the diapers outside in the sun to avoid stains so even though some may argue the added laundry expense, this will cut costs. When diapers are dry, we re stuff with the liner and they are ready to go! Something I've learned about cloth diapering that is really important is you can't use all types if diaper rash cream with them. The good news is cloth diapered babies get less rashes but you do have to buy different creams. I found out coconut oil works great for rashes and is completely safe with cloth diapers. The creams that work with CDs are all organic and natural so probably better than most. I was excited to see how many people responded positively to the picture of our cute little diapers on Instagram and I'm excited to join the CD community! Please leave me any tips or recommendations you've learned along the way. Good luck with cloth diapering! We wanted to do it with Ethan, had the sprayer and everything, but just had trouble finding the right diaper. After trying 3 different brands, we gave up. :\ You sound like you're doing your research, though, which I did only a little bit... ;) So, I'm interested to see how things work out for you! We are cloth diapering also and bought some of those same diapers! We also bought the diaper sprayer and now have it installed! I am so excited to do cloth diapering!!! Glad to see another blogger doing it and will be excited to hear how it goes for you when your lil' guy arrives!!! I am curious if you are going to be a SAHM or work outside of the home mom. I ask because our in home daycare wouldn't do the cloth diapering, which is part of the reason we decided against using them. If you are going to be taking him to a sitter, I definitely recommend you checking with them now. I think it's awesome your going to be doing it. I'm not sure if you read these blogs, but these are some other Texas mommies who CD and eat more organically. Good Luck!! We have four kids, we used cloth diapers with our last baby and it has saved us quite a bit.How many kiddos do u guys want? My husband and I are still a few years away from trying for children, but I am 100% on the cloth diaper train. My friend uses them for her baby and they've saved so much money, much more environmentally friendly, and not any harder to use than a disposable! My question with CD cleaning is how do I keep my washing machine from getting gross? I'm afraid to wash my regular clothes in a machine that constantly washes CD w/ feces and urine. Thanks for sharing. I've been so interested in hearing about cloth diapering. I cannot wait to hear more and see how it goes. I think it sounds like a great idea! woo, that is some serious prepared-ness for the dirty diaper days ahead! I've heard such great things about less diaper rash and ruined outfits with the cloth-diaper route! We went the Huggies route with our son Sawyer, but now that we've probably spent an average of about $80/month for the past 2 years, I am thinking of using them if/when we have a second baby! We're having our first baby in October and have already decided on (bumGenius) cloth diapers. Of course, we've already got some negative comments from some people about how it's 'gross', but we are pretty excited about doing it. Loved reading this! the hubby and I aren't there yet but we would both love to cloth diaper! Thank you for all the info! I'm so excited to see how this goes! We're planning to start trying this year and cloth diapers have always fascinated me! I LOVE the colors you guys got. Smart thinking on the gender neutral stuff for such an investment! Can't wait to hear how you guys like the diapers once baby gets here! OMG! YES! This is exactly our plan as well! HAHAHAHA :) Can't wait to hear how it goes! Ya'll will do great! I get wait to see pictures of your little guy in his dipes! I think it is the cutest thing!! You will LOVE them!! We seriously have loved cloth diapering and now we have moved on to using the cloth pull-ups (from the flip brand) with our little girl who is potty training. I've used a bunch of different brands but so far the bumgenius are my favorite! We love cloth diapering, our little girl is 13 months and we started using those same diapers at about 6 weeks. Rockin green detergent and funk rock work great for when you get stinky diapers! We used the bumgenius detergent for a while but found we were having to strip the diapers often with it. Good luck! You will love it! 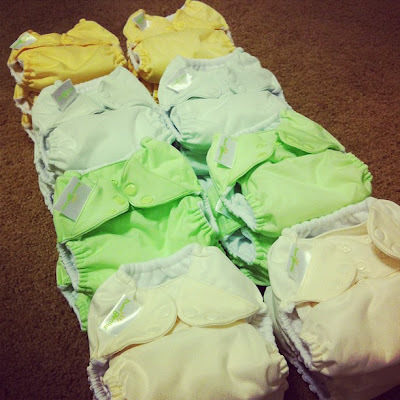 I love seeing that so many bloggers are cloth diapering or planning to! 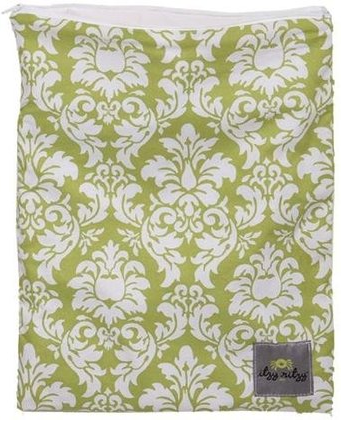 We are also planning on cloth diapering, with the same brand. It was even John & Sherry that first got the idea in my head. I still have four months until baby but I'm excited to see how it goes for you guys! This may sound weird but ever since you mentioned the CD's on Intstagram I have been waiting for this post!!! Husband and I also purchased our first stash of the same kind of diapers (also in gender neutral colors) and I never thought I would be so excited for diapers!! I am going to register for the diaper sprayer. Can't wait to hear how it goes once little Hart starts using them!! We just found out yesterday that we are having a boy so I am even more excited to see baby Hart's nursery. I think we have officially made the decision to not cloth diaper. I did a lot of research and the main thing we didn't like was all of the extra laundry and time it would take. Also that you have to change more frequently. Ryan REALLY was not a fan. I wasn't freaked out about it being "gross" lol. We will be using all natural diapers though (most likely from the Honest Company). And to the reader above who asked about it getting your washer "dirty", everything I read said that because it is pretty liquid poo, or just stains when you start scraping the solids off into the toilet, it's no different than washing your own underwear. The detergent and warm water disinfect it all the same. CD moms will say "our washer doesn't stink or anything". Ruthie I think cloth diapering is a great idea (coming from the girl with no children teehee)! I have always joked with my best girlfriends that I'll be the mother that cloth diapers, makes her own baby food, and breastfeeds her children until the very latest date possible. I think all-natural approaches have been working for SO long, why change them? I like the balance, too of not expecting others to do this for your kiddos, as they shouldn't have to if you go out of town, etc. Smart lady! Sounds like you are planning everything out very well for baby Hart! Can you please convince my husband of cloth diapering? I've talked to him about it a few times along with strictly organic eating when babies come and he's not a fan of either. Phew, I need some prayer and compromise for this, I'm sure! Also, I love your pregger pictures on Insta! You're the cutest and I just love seeing God bless you and J with a baby miracle! this is so great! I cant wait to read more about cloth diapers & how you & baby hart enjoy it. As I am a preschool teacher, if you plan to enroll him in preschool do you plan on CDing him there too? We don't have any parents who do but i would be curious to see how it is in a preschool setting! This is awesome. We're starting the whole "thinking about when we might want to start our family" phase of our marriage and I've been researching off and on. I'll be back here for sure to check out updates and see how it goes. I'm sure it will be great. You two seem to be amazing people so I'm sure that will translate into parenthood. All the best! Cloth diapers are SO much cuter and user-friendly than they used to be! I might have considered trying them 10 years ago if they had been better then. Disposables were super costly and we changed brands a number of times because effectiveness changed as he grew. I hope it all works out the way you want it to! I kind of want to leave a comment on how gross you are just because that sentence was so funny! HAHA! When Carolyn mentioned she wanted to do cloth I thought she was crazy! But then she shared her research and I think it's so great! It's amazing how "user friendly" cloth diapers have become and I think it's wonderful. :) I hope it works great for you guys! Yes I am also curious about a natural laundry detergent. I have always used Charlie's soap but my husband did the shopping last month and bought tide packs at Costco so unfortunately we will be using those for a while. SO excited for all of the posts about your experiences diapering Baby Hart! Your pregnancy posts make me want to have babies now! I am saving them all for when I do finally venture down that exciting path :) Keep up the great blogging. Good for you!! I cloth diapered Liam and loved it! Plan on doing it again with the little lady. I only have 12 cloth diapers- will definitely be buying 12 more because well just 12 isn't enough!! Looks like you have everything we got! I love LOVE the BG CD's!! We have used bum genius diapers for about 20 months and LOVE them! When our daughter happens to get a rash we use an all natural ointment called Grovia Stick...we got it on Amazon and has lasted forever. It is safe to use with cloth diapers. Our daughters daycare even uses them on her which is really nice. Good luck! Good for you guys! That is so awesome! To be honest with you, before Eden came I had 100% no interest in CD. I didn't even research it-- it just wasn't even an option. Now, I am starting to think about it. Especially with thinking about having 2 kids in diapers... the cost will add up... Like you, we can afford disposables but I just am thinking about how much more money we could have in our pocket!!?!! Hmmm... we'll see! So proud of you for doing what's best for your family! I'm sure it will go great! These tend to run bigger than others so if you're not ready to move up to the next size they help. I've had a few leakage issues though but that wouldn't deter me from giving this five stars. They move well too, when they get wet they don't become overly bulky. Curious what kind of detergent you're using?